Welcome to the office of Dr. Samuel Kitching, a family, cosmetic, and restorative dentistry practice in Fort Worth, Texas! The minute you first catch site of our office, you know that you’ve found a good home for your smile. With our front porch and friendly care, you’ll never want to visit any other dentist again! Dr. Kitching is a down-to-earth dentist who will tell you what’s actually going on with your oral health. No slick presentations or upselling; he’s the kind of man who values honesty and integrity. He is a dentist you can trust. All of our services are performed conservatively, with the goal of maintaining as much of the natural tooth as possible. This includes crown and bridgework, restorative dentistry, oral surgery, implant restorations, and cosmetic dentistry. When you need a service that we don’t offer, we will refer you to a member of our trusted network of local dental professionals, which includes orthodontists, to ensure that you achieve the healthy, beautiful smile that you deserve. Since 1985, Dr. Kitching and our caring, friendly staff have been bringing beautiful smiles to families and individuals in Fort Worth and the surrounding areas in Tarrant, Johnson, and Parker Counties. We invite you to call our office today to join our dental family and become acquainted with a better way of dental care. 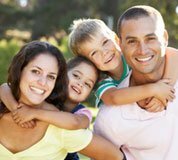 With our experience, knowledge, and dedication, we promise to provide you and your family with positive dental experiences in a caring, comfortable, and familiar environment.